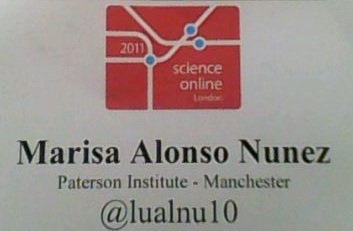 I've just had two great days in London in the "Science Online London 2011" conference (#solo11). This was my first time and I have to say that the experience is been worth it. When I arrived in the British Library the first day I had the impression that there were many people attending the conference. All from many different ages. So I grabbed a coffee and walked around trying to read their badges that, in my opinion, had the key information: name, job place and twitter account. And there was a bit of everything: researchers, journalists, people from scientific journals, from online networks... I loved that because of the potential of this mixture to contribute to the meeting. However, it made me wonder what I was doing there. I got the answer straight away: "learning, meeting people, networking and doing my best to contribute". Because science online is everybody's responsibility and not something restricted to few people. 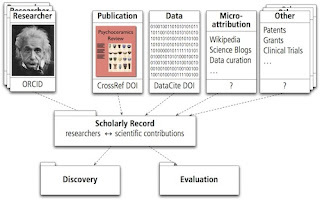 Michael Nielsen gave us one of the first examples of this in the first keynote about Open Science, related to the movement to promote free access to research results. He said that open science is a collective action and that some of the initiatives have failed because most of the research community didn't get involved in them. However, as any collective action, it has to start in small circles and increase little by little (as it happened to Facebook, that started being accessible to Harvard students and few more people afterwards, and ended up being used worldwide). Nowadays there are already some examples of open science and it depends on us to make these grow because knowledge is a public good. After this first talk there were two sessions that I specially liked and I would like to share with you something from. The first one was about microattribution and had Martin Fenner, Mike Peel, Bora Zivkovic and Scott Edmunds as speakers. This is a not well known concept with very few information about. Martin Fenner says that micrattribution ascribes a small scholarly contribution to a particular author. There is not a proper way to cite these personal contributions yet. On the other hand, the recognition of them would be a good incentive for scientists to share their research results even if they have not been published in a scientific paper yet. During the session I realised that this is a very interesting subject we still have to work a lot on. The second session I liked was "So many ways of telling a story" lead by Anton Zuiker and Bora Zivkovic (organisers of Science Online North Carolina). From this session I got a key idea (that I'm pretty sure many of you already know but it's worth to be repeated): when you write for a scientific publication the narrative style is different to the one used when you write for a newspaper and the one used when you write to educate/inform or you blog (in this last cases facts are just one component of the final result). The second day was focused on several workshops introduced by a panel with the title "Dealing with data". One of the best sessions of the conference. Tim Hubbard, Alastair Dant and Kristi Holmes told us their different experiences (maybe too different) handling data. In summary, they showed us how nowadays the way of generating, storing, sharing and visualising data is changing a lot, and if you let me add: "and it has still a lot to change". This was the perfect starting point to go to work to the workshops after an introduction on spinal muscular atrophy (the subject we were going to use for the workshops). The first workshop I chose was "Data visualisation". This is something I've always found interesting even if I have not clue about programming (I'm still in the HTML code). I think the way data are presented influences the way the readers get to those data and understand them. In addition, a friend of mine told me once that my blog lacks graphics and pictures and that it had too many words (and then he added: "well, you are a scientist"...?????). So this was an unresolved matter for me. The workshop was a bit chaotic because Jer Thorp couldn't come to London to lead it. However, he created a very good and easy to follow tutorial. I was lucky because Ian Mulvany sat down by my side and explained quite a few things to me (thanks a lot Ian). Now I'm not an expert using Processing.js but I'm very curious to play around with it and other similar programs. 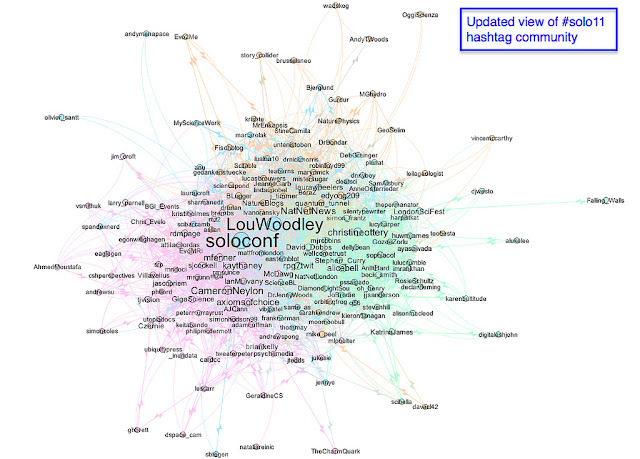 You can get great graphics such as the one I show below about the tweets related to the conference and made by Tony Hirst. Well, it has been amazing to have had the opportunity of sharing these two days with so many people so passionate about science online and to have been part of the discussions, workshops and chats about the past, present and future of something that, in my opinion, will become very familiar very soon. but I can't finish this post without mentioning that one of the moments that I enjoyed the most was the interview to Bora Zivkovic. He worded many of the things I learnt and lived in this meeting, and I want to thank him once again for sharing his time, experience and passion with me. 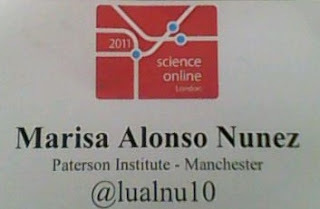 An the final summary that I can do about the meeting can be reduced to four words: science online, passion and thoughts.